Wait! What’s in that load? In that truck there’s Candlewood! 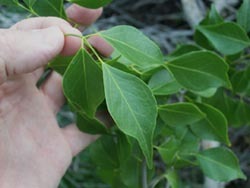 Amyris elemifera is classified as Endangered in the Cayman Islands. On Cayman Brac only saplings are generally seen, and not many of them, because bigger trees were cut down. But in the roughest terrain of the central forest, specimens up to 8 inches in diameter still exist. Candlewood was just too useful for its own good. A green stick of Candlewood will hold flame overnight to light the morning fire. It was used for building the early wattle and daub houses, apparently as a point of pride since the more common Cabbage tree was probably just as good. (The remains of the 19th Century JD Hunter house has Candlewood wattles. Slice a piece with a knife and the distinctive resin smell is just as strong as ever.) Land boundaries were marked with sticks of Candlewood stuck in stone cairns, every 50 feet, and the wood remains sound well after 50 years. This wood was truly prized by Cayman Brac’s pioneers. The tree remains lovely today and should be protected. The shapely, glossy leaves have a bright, refreshing smell when scrunched in the hand.